I have rolled thousands of dolmades in my cooking career, but never before have I filled them with meat. Pickled vine leaves rolled into a cigar shape with a herb spiked rice, pine nuts and currants filling are a popular ready to go meze which I made in huge batches every week for 3 years to sell in my specialty food store, but since the business closed and weary of dolmade production, I’ve only occasionally made small quantities since. 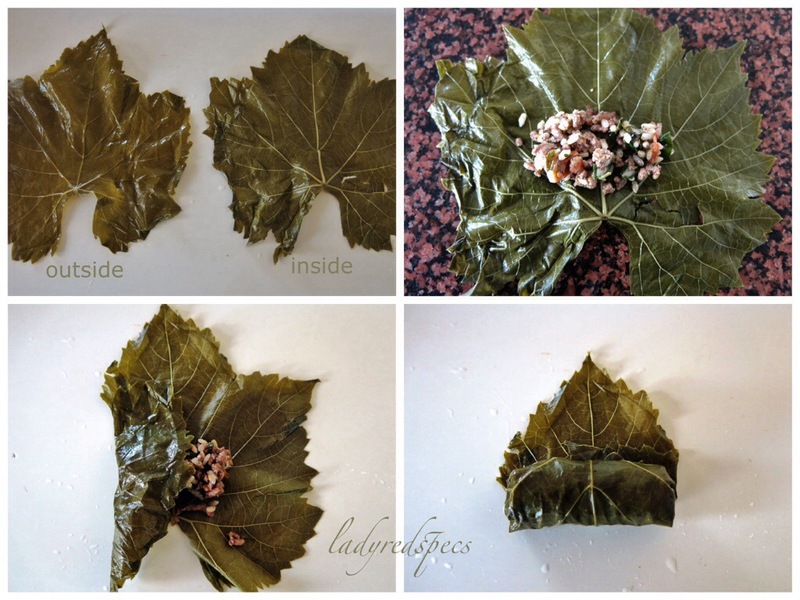 There are no tricky ingredients or techniques needed to make Tessa Kiros’ recipe from “Falling Cloudberries” for dolmades with a meat and rice filling, but cooking with vine leaves preserved in brine needs close attention to detail, so sharing my experience…………..
1. The vine leaves need to be separated, soaked in cold water and rinsed as they can be very salty. 2. Put a layer of leaves on the base of the saucepan 3-4 deep, use any very small or torn leaves for this. 3. Place the filling on the underside of the leaf so when they’re rolled, the smooth glossy surface is on the outside. 5. Don’t overfill the parcels, but be sure to roll each dolma tightly. 6. Closely pack each layer of stuffed and rolled vine leaves into the pot. 7. Be liberal with the oil so the dolmades don’t stick together. 8. Lay a plate over the dolmades in the pot while they cook to prevent them floating. Follow these few simple guidelines, no matter what you use for filling and you’ll be assured of success. Using the recipe for Dolmades in Falling Cloudberries by Tess Kiros, as a guide, this is my contribution to the first Cookbook Guru for 2014 hosted by Sharing the Food We Love. I own a number of books by Tess Kiros. She writes accessible recipes for simple family food influenced by her melting pot heritage and the places she has lived. Her recipes are generally tasty and unpretentious. I have made a few minor changes to her recipe. Separate the vine leaves and leave to soak in a large bowl of cold water. Heat 2 tablespoons of olive oil then thoroughly brown the meat. Stir in spring onions, tomatoes, herbs, spices and rice. Season with salt and pepper and cook for a few minutes, leaving the rice firm. Season with black pepper but do not add salt. Cool slightly. Rinse the leaves and drain. Lay the leaves shiny side down, place a dessertspoon of filling at the stem end, fold in the sides then tightly roll the leaf into a cigar shape. Line the base of a deep saucepan with a layer of 3-4 flat vine leaves. Lay the dolmades on top in firmly packed layers. Sprinkle the lemon juice and remaining olive oil on top then add 2 cups of water. Lay a plate over the dolmades to keep them submerged. Bring the pot to the boil, cover, reduce the heat and simmer for 1 hour. Serve hot or cold with a dollop of Greek yoghurt. Verdict: I was a little disappointed by these dolmades. The herbs and spices in the filling and the acidity of the lemon juice were quite indistinct. 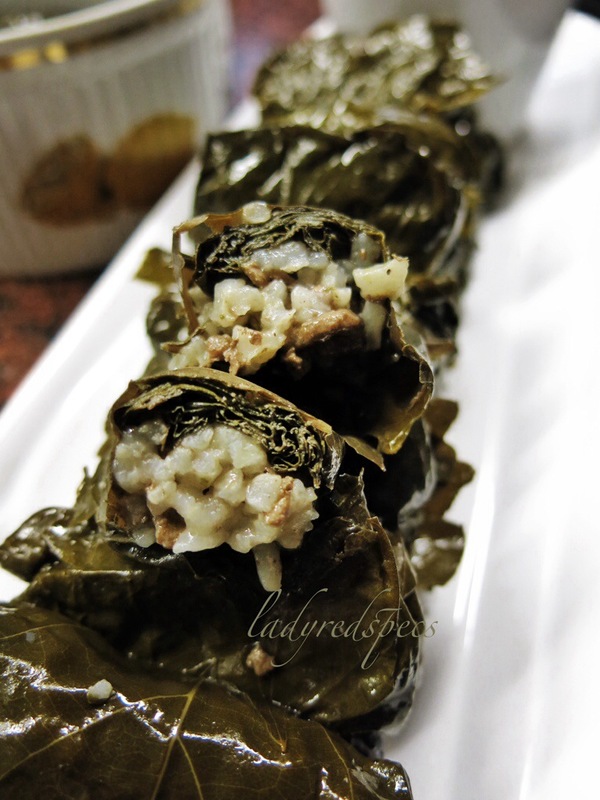 Making this recipe has sparked the interest in making my own version of dolmades, simply filled with rice to appear in a future post. These are wonderful. Nicely rolled! I love dolmades and have several markets here in Seattle that sell them, however, I can never find them like I had in Greece. I have always wanted to make them but feel a bit intimidated. Nice to read the comments about the grape leaves…and as you know, I’m a huge Tessa fan. Hopefully you do post your version of these too. Thanks Seana, I made a batch to my recipe yesterday, much, much happier. Look for the post next week. They are really quite simple to make, no need to feel intimidated at all! This is the first Kiros recipe that has disappointed me, but I guess none of us are perfect! How interesting! I made a batch of these for our Thanksgiving potluck (a Persian recipe – very similar to this) but forgot to take pix. I love how you’ve charted the process of bundling up the vines which is harder than it looks in practice. At least for me! I would love to try dolmeh again with fresh leaves but I also used package ones and oh boy, they were tough. Had to be boiled for 10 minutes to soften. Can you believe that?? anyway, yours look delicious and beautiful, that’s mainly what I’ve been trying to say. Thank you Azita, I do sort through the leaves and discard the extra large, generally tough specimens. Those that I buy are generally OK, they’re imported from Turkey. I really enjoyed your informative post and all the comments. I have five grape vines growing at one end of our apple orchard. I think I’ll pick some of the leaves this year and try to make dolmades. I’ve never made them but do enjoy them. Hi Karen, they are really very simple to make. There will be another post shortly with an alternative rice filling which we much prefer, stay tuned. I’m looking forward to your favorite filling. Thanks again for the step by step photos…that really helps. This looks lovely…. I’ve never had them, but would definitely love to try! I’m wondering what you would compare the vine leaves to… like a spinach or kale? They have a very distinct flavour, not unlike black tea. It would be hard to replicate the flavour with a substitute. Greek/Turkish food stores often have canned dolmades already prepared that are reasonably priced and quite tasty. That would be a good starting point to try the flavour. Don’t you love the way blogging introduces you to new food? Ladyredspecs has contributed a beautiful meat filled version of Greek Dolmades from Falling Cloudberries from this month. Make sure you check out her post for a great step by step way to create these delicious morsals. I’ve never felt confident enough to try it, but I have a similar recipe to yours that works just fine if you stuff the mix in red capsicums. Like Bacchus you mean? I’m sure the meat filling would be beautiful in sweet red capsicums. I once got a bag of fresh vine leaves from a friend’s mum, it was so much fun! Thanks for the tips. Making dolmades gets easier the more you do it. All the chat about fresh leaves has left me thinking I need to find a reliable source! I’m not 100% sure, but I think they are the same. As far as I know, the main difference between fruit bearing and ornamental vines are whether the vines put more nutrients etc into producing grapes. But there might be some varieties that are not edible?? Meat filled dolmades are a common winter type of stuffing in Greece. They are often paired with stuffed courgettes (same filling) in a casserole. I planted a grape vine in my garden just so I could have my own supply of vine leaves rather than relying on heavily salted commercial ones – they are also much more tender. I love Kiros’ recipes and think Falling Cloudberries one of her finest books. I use a very similar stuffing for both eggplants and golden nugget pumpkins with great success, however, because I don’t have access to fresh vine leaves I have to manage and minimize the saltiness of the preserved variety. Tessa’s filling, in my opinion needed lots more herbs and spices to stand up to the leaves, even after soaking and rinsing. While they were no too salty to eat the vine leaf flavour overpowered the filling. On the whole I love Tessa’s recipes, but this one was under whelming. It really is too bad you don’t have access to fresh vine leaves – so much better! Greek friends of mine who have used commercial vine leaves actually simmer them first, drain and then soak for 24 hours, changing water occasionally before using. A lot of work! And, I agree that the recipe needs more herbs. Your stuffed mini nugget pumpkins sound intriguing! I remember rolling hundreds of these while working in a Greek restaurant in Edgecliff many years ago. I’ve got to say, I’ve never been a huge fan of preserved vine leaves though. Mum and dad have a vine in the backyard that keeps us supplied throughout the year. We simply freeze them and defrost what we need. I look forward to a future post with your version of these little parcels of yum. Lucky you, I’ve never been fortunate enough to have a supply of fresh vine leaves, but choosing the youngest from the package for wrappers and the older leaves to line the pot I’ve been pretty lucky with the result. You do need to be diligent in the desalting of them however. Using a salt free rice filling also helps balance out the flavour. I hope to make a batch of my old favourites in the coming week. stay tuned! 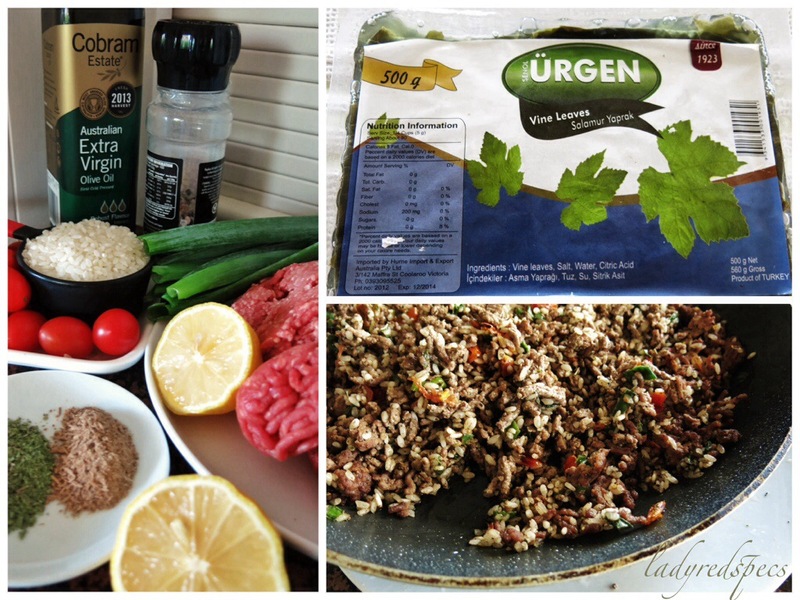 This entry was posted on January 9, 2014 by ladyredspecs in FODMAP diet, Food, Gluten Free, Lamb, Light Savoury Dishes, Side Dishes & Salads, The Cookbook Guru and tagged beef, dolmades, FODMAP friendly, gluten free, Greek, rice, Tess Kiros, vine leaves.